A “usual” day in the life of an ISAAC member starts only one hour after the Sun wakes up. He rushes through all the daily morning activities while his “Wake up” playlist blasts in the background. As every student can tell you, overcoming the strange force pulling you back under the covers so early in the morning is the toughest battle you’ll probably have to fight the whole day (especially when not enough hours of sleep have been scheduled). The bus shows up on time, the subway goes every 5 minutes and so, making it in time for the 8:15 ISAAC general meeting is nothing but a trivial matter. The meeting starts. The first thing on the agenda is assigning a minute taker, “randomly” … more often than not. Quick status updates on everything that has been done the past days are being shared as the virtual mic goes around the room. The plan for the next couple of days is also devised. We are behind schedule, the bachelor students must finish their theses in 2 weeks and tiredness can be seen on some of the present faces, but the atmosphere is relaxed and spirits are high. Setting my personal lament aside I’ll continue the trend and bring you up to date with the design of our Specific Receiver Unit, the RxSU. We have pushed it quite a bit, everything seems to come into place and people’s efforts and work are starting to mix together. 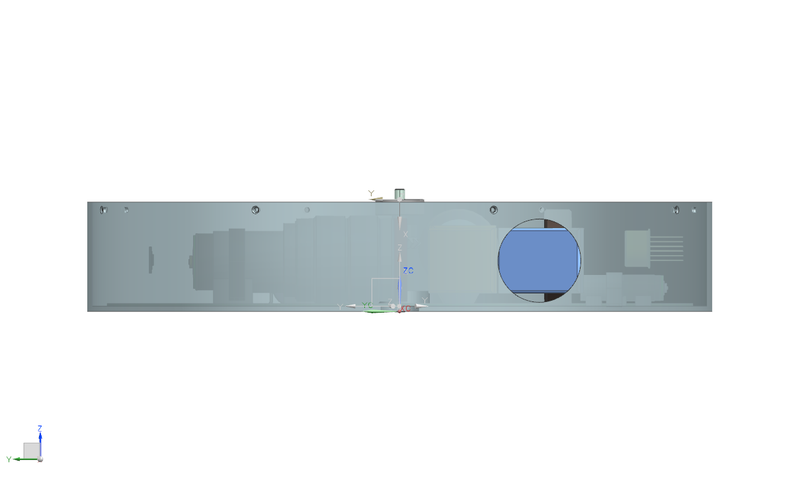 In the figure above a top view of the unit can be observed. The incoming light should make its way through the aperture set in the side of the unit and hit the first grey rectangular mirror that has a tiny (currently unattached) stepper motor behind it. The motor will act upon the mirror in order for the light to always get across to the beam splitter (orange rectangular plate), through the lens and all the way to the camera sensor. 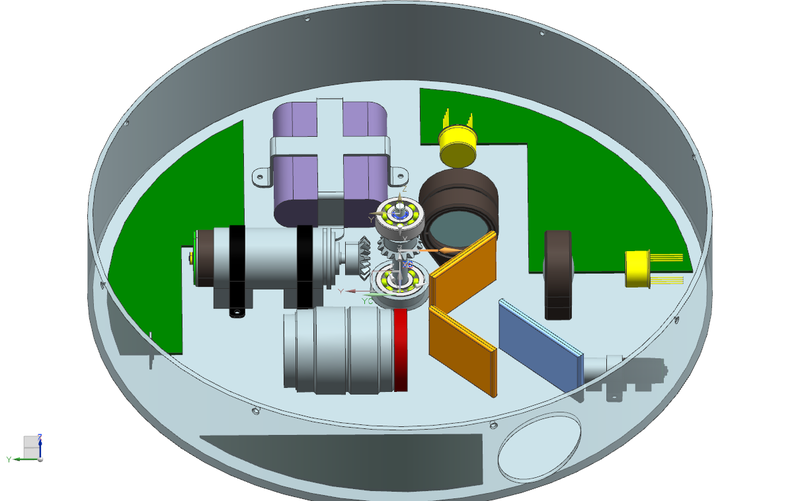 In the bottom right of the unit the paths for the IR light can be traced out, both of them ending with the IR sensors (the yellow cylinders). The motor spinning the unit and the battery can as well be seen in the middle and top right part of the RxSU. 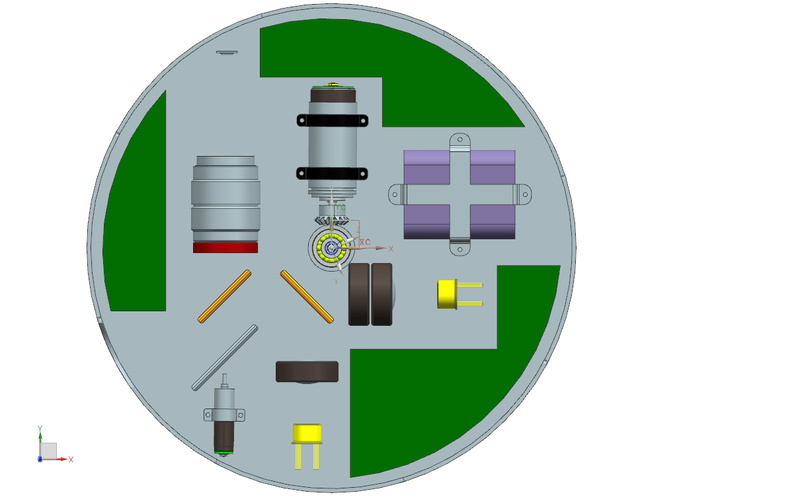 The green shapes show the place where PCBs (Printed Circuit Boards) could be placed in. The figures bellow depict the same assembly from two different points of view in order to better accentuate on specific aspects of the design. In the first figure the aperture and the mirror can be seen from the perspective of hasty photons rushing in, while in the second figure a 3D view of the whole system is presented. We’ve come a long way, there’s still a lot to do but for now sleep takes over. This entry was posted in Uncategorized and tagged CAD, ISAAC, ISAAC rocket RxSU CAD Vlad, REXUS, RxSU, Vlad by vldgrig. Bookmark the permalink.